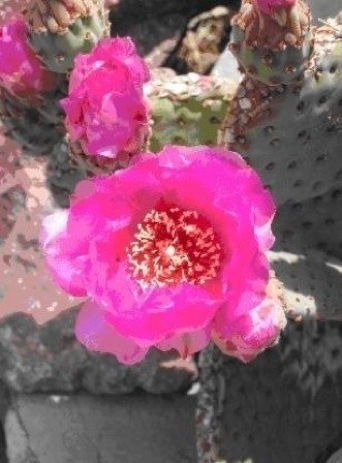 The pictured flower is Beavertail Pricklypear (Opuntia basilaris), a usually spineless pad cactus found in western Arizona and parts of Utah , Nevada , and California . The magenta flowers are fairly large, typically between 5 and 7.5 cm across. Ethnographic data indicates that Beavertail Pricklypear was used by various native groups, with the buds, seeds, and joints all consumed. The Cahuilla, for example, would cook, dry, and store the buds, grind the seeds into a mush, and boil the joints (pads) to mix with other foods or eat them as a green. The photograph was taken by Johnida Martin, a Wildlife Biologist with ACS’ Environmental and Safety Division. Dr. Glenn Stuart is our Senior Paleobotanist. He has analyzed pollen and macrobotanical samples from the Boreal Forest, Plains, Rocky Mountains, West Coast, Great Basin, Greater Southwest, West and Central Mexico, and Central America . To learn more about ACS and the services we offer, please visit the rest of our web site.